Wholesale gold and silver jewelry factory thailand | How to order | Jewelry with precious and semi-precious gemstones | Sterling silver 925 and 14k jewelry | Gold 10k 14k 18k jewelry | Paragon Worldwide (888) Co., Ltd. Bangkok Thailand. - The balance 50% to be paid in advance before delivery. 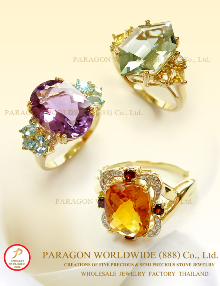 Account name: PARAGON WORLDWIDE (888) CO., LTD. Note: Price is quoted in EX-Factory. Any transfer fee or money exchange fee will be at buyer responsibility. 2) Delivery Estimates: 2 - 8 days to major destinations. Our product is made to order. In most case, we ship order in 4 weeks. During the holiday season or peak season, it is important to get your orders in early so that we can meet your deadlines. Please notify us within 3 days via email, if there are any missing or defect items. After our confirmation, you will receive a full refund or a replacement. Use Nickel or Lead In Your Products? All our products are nickel safe.